In the first decades of the 17th century, Japan’s Tokugawa shogunate encouraged foreign trade. The shogun had the monopoly on trade with non-Japanese, and made giant gobs of money from it between 1603 and 1635. In 1635, the shogunate changed gears completely, introducing Seclusion laws that prohibited foreigners from entering Japan and Japanese from leaving. The only foreign ships allowed in Japanese territory under these new laws were Chinese, Korean, and Dutch, and their movements were highly restricted. 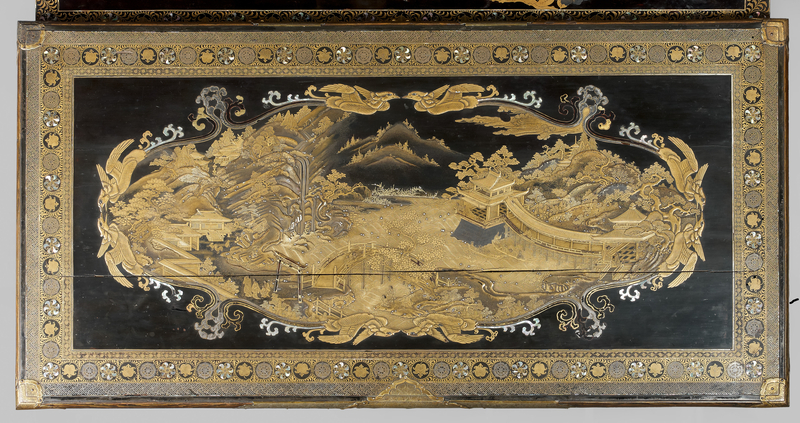 Around 1640, chief of the mission of the Dutch East India Company François Caron commissioned a group of gold lacquer boxes from the Kaomi Nagashige of Kyoto, a master craftsman who was the official lacquer-maker to the Tokugawa rulers. In 1639 he had created an exceptional bridal trousseau of 75 boxes for two-year-old Princess Chiyohime on the occasion of her engagement. The lacquer decoration featured scenes from The Tale of Genji, a romance written in the early 11th century by noblewoman and lady-in-waiting Murasaki Shikibu which is often described as the first novel (you can download the whole book for free here). The baby princess’ trousseau is a Japanese national treasure today, part of the permanent collection of the Tokugawa Art Museum in Nagoya. 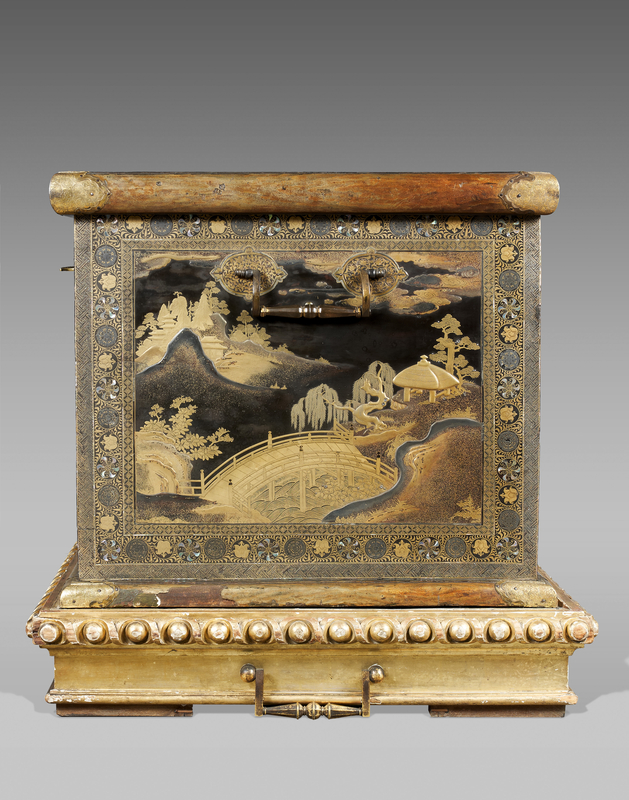 Caron’s commission was smaller in number — a dozen boxes, ten small, one larger but still petite box and one extra-large chest — but also featured scenes from The Tale of Genji. 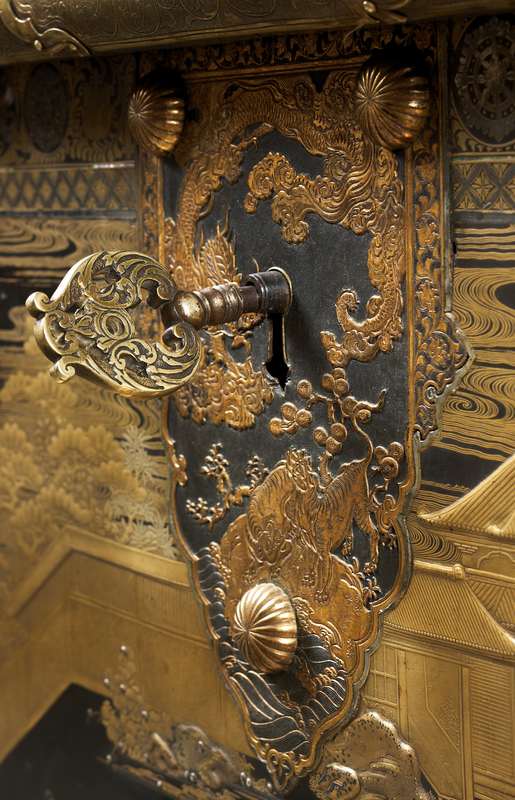 Because he was in Shogun Tokugawa Iemitsu’s good graces, Caron was able to secure the finest quality of lacquer, the kind of thing that would normally be seen in the palaces of the Shogun. 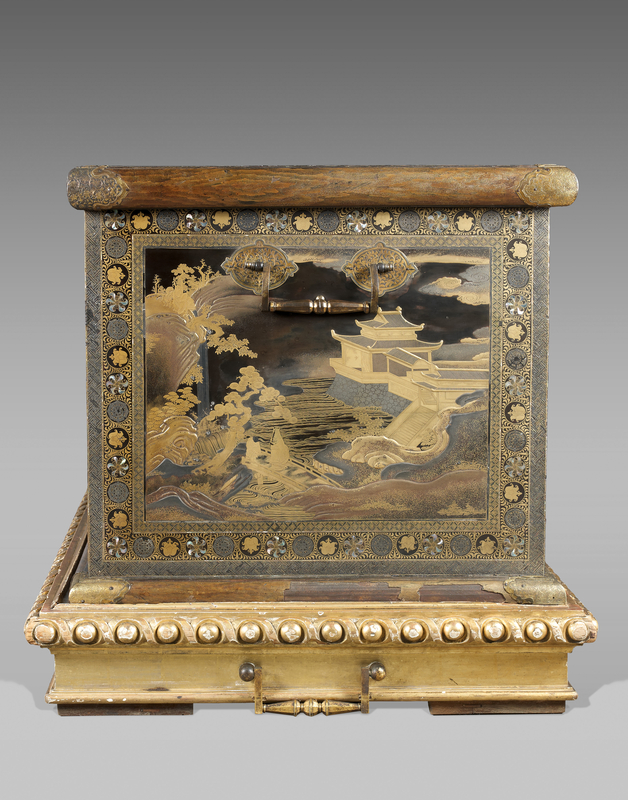 The chests were decorated with gold, silver and copper foil, sheets and powder and mother of pearl. The painstaking process of creating these marvels took at least two years. In 1641, the Shogunate instituted another law, this one prohibiting the exportation of “art objects, including objects of lacquer, screens and other decorated with motifs of city, castle, human figures and above all, armed men.” The punishment for violators was beheading. The law was promulgated on August 14, 1641 and remained in force until 1864. 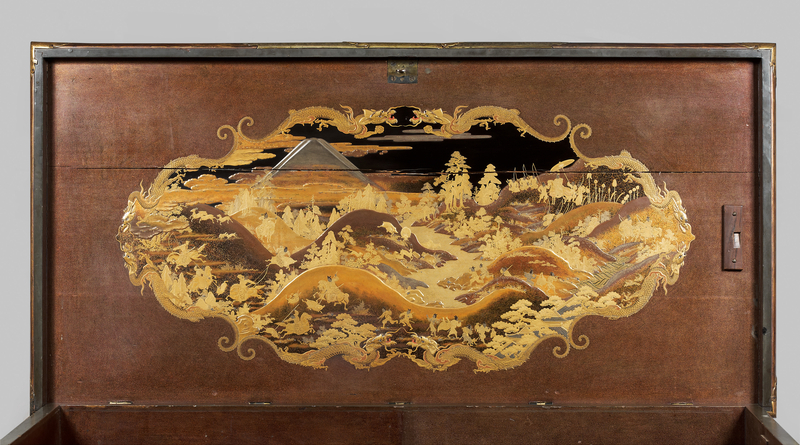 Caron was grandfathered in, however, and in 1643, the lacquer boxes left Japan for the Netherlands. The high cost of the boxes and instability from the Thirty Years’ War make them a hard sell. In 1658, Cardinal Jules Mazarin, reputedly the richest man in Europe, stepped into the breach. The French ambassador to the Netherlands’ main mission wasn’t diplomacy but rather to acquire Japanese lacquer for Mazarin’s collection. Mazarin bought the two larger chests in Amsterdam and transported them to France on a warship. 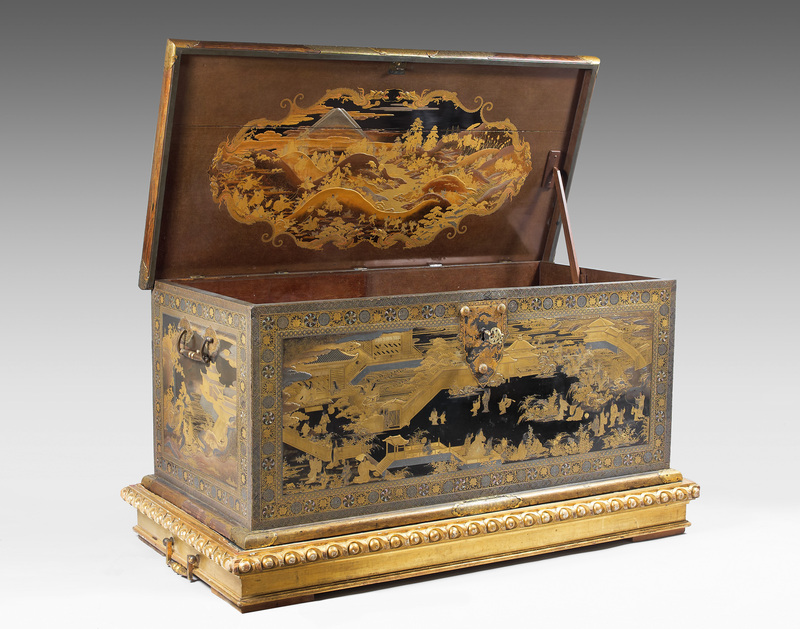 After Mazarin’s death in 1661, the chests passed by descent through the family until they were purchased in a French Revolutionary fire sale by a haberdasher who sold them to the wealthy British writer and art collector William Beckford. He willed the lacquer masterpieces to his daughter Euphemia, wife of the Duke of Hamilton. The chests remained at Hamilton Palace until they were sold in 1882 to raise funds to repair the palace. The smaller of the two chests was bought by the Victoria & Albert Museum. The larger one was bought by President of the Royal Horticultural Society and collector Sir Trevor Lawrence (history loop: his maternal grandfather was a haberdasher). He died in 1913 and when his estate was liquidated in 1916, the chest was bought by Welsh coal baron Sir Clifford Cory. Sir Clifford died in 1941, and that’s where the trail ended. 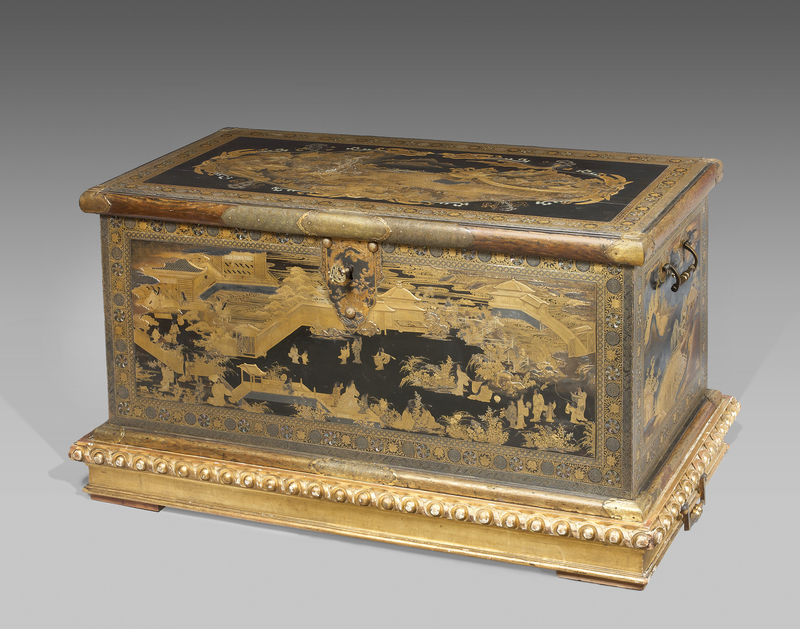 In the middle of the Battle of Britain, the estate was sold at auction with the lacquer trunk described solely as “a large Chinese chest.” the Mazarin link was forgotten as was its real country of origin. From that point on, the largest of Mazarin’s golden chests was considered lost. The V&A looked far and wide for it, anxious to bring the two rare beauties together again. As freak occurrence would have it, the chest was actually a three minute walk from the museum in the home of a Polish doctor named Zaniewski. He bought it from the Cory auction for a pittance. In 1970, Dr. Zaniewski sold the chest for £100 to a tenant of his, a French engineer who worked for Shell Petroleum. The engineer used it as a TV stand in his South Kensington apartment for 16 years, then brought it with him when he retired to the Loire Valley in 1986. There he used it as a bar. Oblivious to all this, in 2013 the engineer’s family called in the auction specialists of Rouillac to appraise and sell his estate. Philippe Rouillac found Mazarin’s lost golden chest in a house in Touraine propping up spirituous beverages. 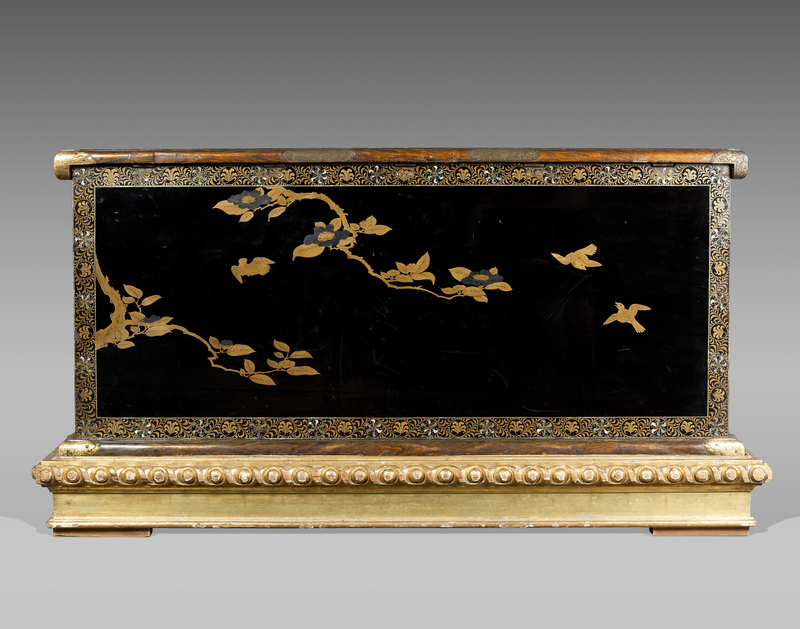 At the June 9th auction held at the Château de Cheverny in the Loire Valley, the Mazarin Chest sold for 7.3 million euros ($9,544,000) including buyer’s premium. Two dedicated bidders drove the price up from the opening 200,000 euros, and for once, neither of them were anonymous private collectors. One was an American museum (I’m guessing the Getty, because it has the gigantic acquisition budget you’d need for this kind of caper and because in 2009 they had a whole exhibition dedicated to Japanese lacquer which starred the V&A Mazarin Chest); the other was the Rijksmuseum. The Rijksmuseum, fortified with funds from the Jaffé-Pierson Foundation, the BankGiro Lottery and the Rembrandt Association, won. They are superstoked about it. 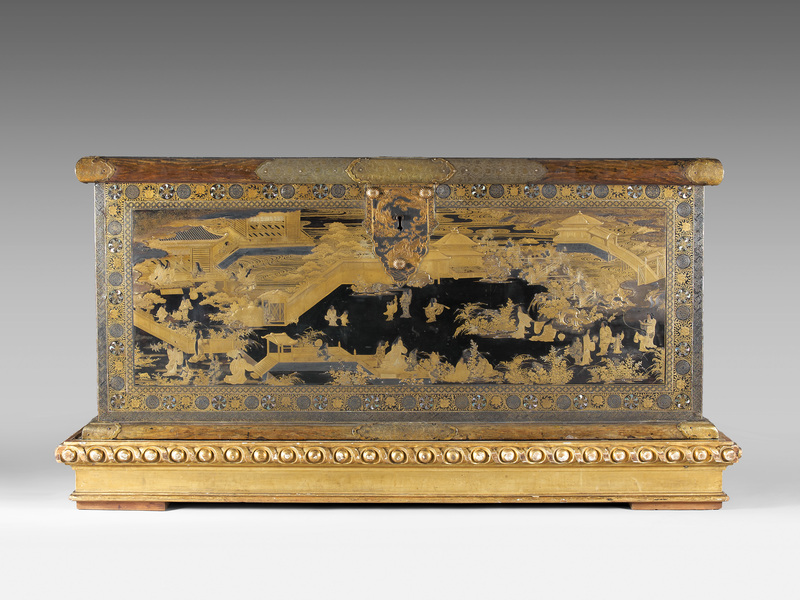 No Dutch museum has a piece of Asian furniture art of this quality, and since it was commissioned by the Dutch East India Company and spent the first 18 years of its life in Amsterdam, the Mazarin Chest, the largest known lacquer artifact in the world, is coming home, as far as the Rijksmuseum is concerned. This entry was posted on Wednesday, July 10th, 2013 at 11:54 PM	and is filed under Renaissance, Treasures. You can follow any responses to this entry through the RSS 2.0 feed. You can skip to the end and leave a response. Pinging is currently not allowed. Amazing. Even the *back* of the piece is a work of beauty. It is. I really love that black lacquer-intensive minimalism. Hello there, What are your thoughts on why the top has that long lateral crack, and what could the museum do to fix it, if they chose to? I would imagine the crack developed from the natural shrinkage of the wood over the time. The Victoria & Albert Mazarin Chest also had a crack in the lid. They repaired it using Mugi-Urushi, a natural wheat lacquer. There are some fascinating videos of the repair work on the V&A’s website. Astonishing, given its age and what it must have been through in the course of an even relatively sheltered life (a BAR? ), that the lacquer-work is in as good shape as it is. Most surprised if the Rijksmuseum does more, re the crack, than ensuring climate conditions that minimize the chance of further splitting, which will be simple enough, for them, to do. In addition, craftsmen sufficiently skilled to execute work of this quality, surely also knew how to select strong, stable wood as a base for their work. The bar thing is so insane. I mean, I put a coaster under drinks on my glass coffee table just because I don’t want to wipe up condensation rings. The idea of a using a gorgeous wood lacquer box, even if you don’t know how old it is or where it came from, as a bar makes zero sense to me. It’s a very lucky break that the lacquer didn’t come off in shards and the wood didn’t warp and discolor even more. The wood is cedar which means that chest smells as good as it looks. No doubt the Rijksmuseum is going to do an in depth condition assessment. If they do decide to repair that crack, they’ll probably use the same or similar method the V&A used: natural lacquer discretely applied to the gap. So beautiful! I can’t believe it was a TV stand! LOL! Right? If anything the TV should have been the stand for the chest. There’s no question of which one has more beautiful scenes to watch. I know that museums and countries can really get heated on who “gets” a valuable piece, but, and I think a lot of us agree, as long as it’s viewable to the public, even if it’s just great pix like the ones you always seen on this blog, we all “get” it. And I just feel lucky to see something that everyone thought might be gone forever. I agree with you wholeheartedly. For something so exquisite to be hidden someone’s home is a crying shame. Now we can all pay our respects to the great artisans who made the chest and to its rich history. Thank you for the picture props. You really need high resolution to be able to see the small details of this piece. Even a large picture, which would be fine for, say, a sculpture, wouldn’t be enough because you’d miss amazing things like the waves in the river and the animals in the chase scene on the cover. Wow! Amazing, just amazing! What detail, what exquisite details of the water, the plants, the structures – everything! Amazing that it survived as well as it did, after being used as a TV stand and a bar! I’m glad it’s “home” again in the Netherlands. Thank you for sharing this! My pleasure. I knew as soon as I saw the pictures and picked my jaw up from the floor that this story needed to be blogged. The French auction house which sold the chest has very good photographs and a lot of detailed information about the history of the chest (though all in French of course!). The url is http://www.rouillac.com. I linked to them in the post, and of course included the pictures as well. You know if you click on all the thumbnails in all of my posts you’ll see full size versions, right? Kaomi Nagashige　is correct as Kouami Choujuu (幸阿弥長重) from KYoto,I believe. This was an informative mystery with such a positive ending. Hopefully, it will remain a treasured object and its preservation will be assured forever. The chest really is a wonder and the saga of its ownership and travel was impressively presented. It makes you wish the chest could magically speak and tell the details of it’s sojourn.